In large bowl, combine brownie mix, espresso powder, oil, water, and eggs; beat 50 strokes with spoon. Spread batter in greased pan. Sprinkle evenly with mocha candy beans. Bake at 350°F. for 28 to 30 minutes. DO NOT OVERBAKE. Cool 1 hour or until completely cooled. Cut into bars. Not to be confused with chocolate-covered coffee beans, mocha beans are coffee-flavored candy beans. The candies are available at specialty cooking stores, candy shops and coffee shops. If you can't find mocha beans, use chocolate chips in their place and increase the instant espresso powder to 3 tablespoons. 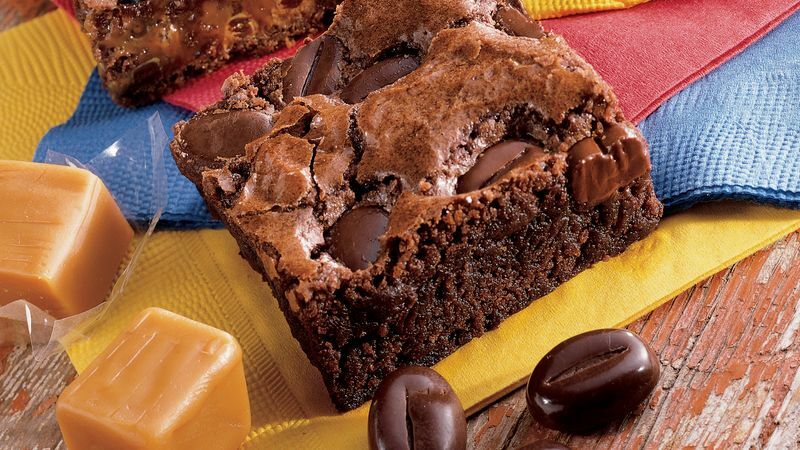 Served with a scoop of ice cream, these brownies become an even more delicious dessert. Cut brownies about twice as long as the recipe indicates; place them on individual plates and top with ice cream. To go all out, drizzle the brownies and ice cream with chocolate sauce and sprinkle a few extra mocha candy beans on each plate.